Title: "Who Is The Man Called Photon?" In Wantagh Point, Long Island, Nova arrives to meet his uncle, Dr. Ralph Rider, who's agreed to help improve Rich's grades by being his tutor. After changing back to his street clothes, Rich Rider checks the time. It is 2:30 and Rich is concerned that his uncle is late. His thoughts are interrupted by the screeching tires of a speeding car. The car stops and the driver runs into police headquarters shouting that there has been a murder! The police captain on duty, Captain James Steele, tells the man to calm down and tell him what's happened. The man introduces himself as Jason Dean, a businessman from Connecticut. Mr. Dean had been at Dr. Rider's home in order to bid on the doctor's newest invention. At 2:15pm, the wall of the living room began to glow and melt as a costumed man entered the room. The costumed villain told Mr. Dean to bring him Dr. Rider. When Jason panicked, the man knocked him aside and melted the wall leading to the kitchen. Mr. Dean explained that he ran and came straight to police headquarters. At that moment, Rich walks in on the conversation and all three of them immediately go to Dr. Rider's home. When they arrive, they find a man named Happy Daze recovering from an attack by the costumed man. All of them run to the library where they find Dr. Rider dead. He is sprawled over a number of calendars and next to him is a stunned Peter Parker. Unknown to everyone in the room, Peter Parker is secretly the hero known as Spider-Man. Rich jumps to the wrong conclusion and believes Parker is the murderer. Peter tells his side of the story. Peter explains that it was 2:20pm and he was discussing anagrams with Dr. Rider in the library. Suddenly, the wall began to glow and a costumed man entered. The man claimed that his name was Photon and he had come to kill Dr. Rider. Peter attempted to stop Photon but was blasted unconscious by the villain's photon beam. Rich leaves to call his father to give him the news about his brother. After the call, Rich changes to Nova and begins to search for Photon. At the same time, Peter Parker also decides to find Photon and becomes Spider-Man. While searching the grounds, Spider-Man spots a man running across the yard. The man attacks Spider-Man but is easily knocked away. Overhead, Nova sees the scuffle and thinks Spider-Man might be the killer. The two fight briefly and Nova realizes Spider-Man is a hero and not a villain, as the press makes him out to be. Nova apologizes and chases down the man Spider-Man was fighting. After the heroes arrive at the Rider home, Captain Steele begins to question the captured man. The man's name is Michael Lincoln and was Dr. Rider's lab assistant for the last two years. He claimed to be the true genius behind Dr. Rider's work and hated the doctor. Lincoln felt his work was never acknowledged and was glad Dr. Rider was dead. He also claimed to be innocent of the actual murder. Captain Steele turns his attention to the next suspect, Mr. Risk. Risk is a businessman with a shady reputation who came to the Rider home to bid on the doctor's invention. The businessman explains that the invention was a transistorized nuclear device and that his company wanted to have it. When confronted about the murder, Risk states that he heard Dr. Rider scream at 2:25pm and was downstairs away from the library. Dr. Rider's butler, Manners, enters and tells Captain Steele that he has important information regarding the killer. The men leave the room to discuss the situation. Happy Daze and Jason Dean quickly excuse themselves from the room. Moments later, Photon enters the room looking for the butler. 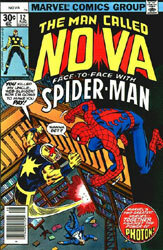 Nova and Spider-Man quickly begin battling the costumed villain. The heroes discover Photon is wearing a bio-costume which enhances his natural abilities. During the fight, Photon blasts the room where Captain Steele and Manners are talking. He also starts a raging fire to distract the two super-heroes. Spider-Man puts out the blaze but Nova is unable to find Photon. However, he does find Daze walking in the hallway. Daze claims nobody else had been in the hallway. Nova and Spider-Man return to the library just as Lincoln and Dean enter the room. Lincoln begins to rant about his jealousy of Dr. Rider and how much he hated him. Captain Steele tells Lincoln that Manners had informed him about the threats he made on Dr. Rider. Manners had also given Captain Steele secret information on everyone else in the room. *Harry "Happy" Daze turns out to be an agent of A.I.M., an organization of evil scientists. *Michael Lincoln had been fired by Dr. Rider earlier in the day. *Franklin Risk was a strong-arm businessman who wanted Rider's invention. *Jason Dean works for Maggia, a powerful crime cartel. Suddenly, the lights turn out! When Nova restores the lights, Risk, Dean and Daze are gone! Nova asks Steele if Manners had told him anything else. Captain Steele informs them that just as Manners was about to tell him who Photon was, he was murdered.